Sureq Galigo, also known as La Galigo, is the creation epic of the Bugis people. The epic was developed as oral tradition by scores of generations of storytellers prior to the 14th century, when the indigenous Bugis script was developed and the epic began to be transcribed. Today La Galigo exists in both oral and written forms each of which has influenced the other over centuries. The more than 100 known manuscripts comprise over 6,000 folio pages making Sureq Galigo, perhaps, the longest text in the world, longer than the Mahabharata. The story starts in pre-history Luwuq, the kingdom regarded as the cradle of Bugis culture, and moves to many locations throughout Sulawesi and beyond. Central to the story is the importance of genealogy which triggers most of wild adventures of the central characters in their quest to find and marry a person of the appropriate royal, white blood. The Sureq Galigo family tree begins with the gods of the Upper and Under Worlds who send one of their children to populate the Middle World. The hundreds of adventures, intrigues, wars, ceremonies, cockfights, loves stories and elaborate weddings that make up the epic, are about the six generations of their offspring. At the end of the story, the gods gather all their descendents in Luwuq, and send them to the Upper and Under Worlds. The face of the Middle World is emptied and purged, and actions mirroring the beginning of the epic are repeated. Children of the epic's main characters are sent from the Upper and Under Worlds to populate a new world. Only this time, the gates to the Upper and Under Worlds are closed and locked forever, life in this new world – the world as we know it today – begins, but without the further intervention of the gods. There is no standardized version of La Galigo. Over the centuries different chanters and writers have added characters and episodes. There is also no standardized version of any episode. While the main characters and key elements of the larger story are maintained, the same episode may appear in manuscripts of dramatically varying lengths and content. This was surely influenced, in part, by how long a storyteller was commissioned to chant and how many of those versions of the story were put into written form and further developed. 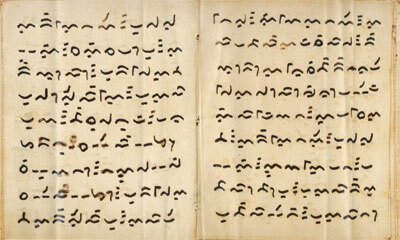 Some manuscripts have been developed to reflect the changes in Bugis society. In one version of the final episode the main character descends to the Under World, travels to Mecca, and emerges as Mohammad -- an inventive way for the epic to live on while making it clear that its stories and belief's predate Islam. This production of I La Galigo is one of many possible versions and by no means definitive.